Finding the perfect special occasion dress is never easy, but your options are endless if you consider shopping online as opposed to sticking strictly to brick-and-mortar stores. I have been an avid consumer of dresses from the California-based website Ever-Pretty since purchasing my first dress with them on Amazon.com. Their dresses are affordable, fashionable, comfortable, and flattering. Best of all, you can search for specific occasions, whether it’s for bridesmaid dresses or a cocktail party, by choosing the option that best fits your needs under the “All Products” tab on the navigation bar. 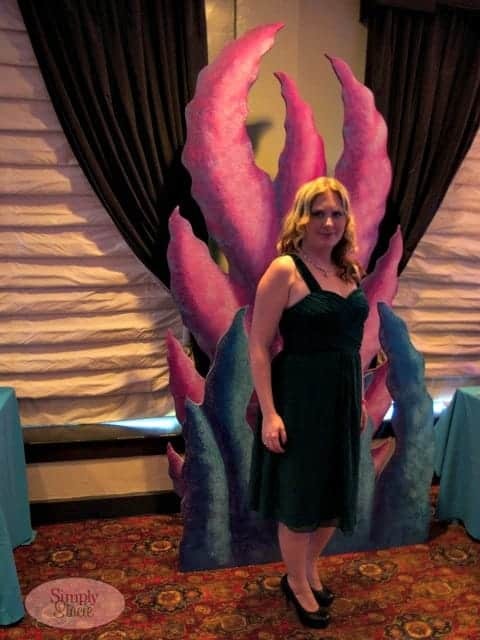 I found myself in need of a new dress for a The Little Mermaid-themed cocktail party I attended in Los Angeles during the first week of August, and Ever-Pretty was more than happy to help me select the perfect dress for the occasion. I wanted to find a dress that would fit the spirit of The Little Mermaid, whether it was a perfect color match to Ariel’s hair, tail, or even her purple seashells. After considering several different dresses (and believe me, I had such a hard time choosing between so many options! ), I found the perfect green dress to match Ariel’s tail. The Elegant Ruffles Padded Chiffon Bridesmaid Dress (MSRP $54.99 USD) is tight-fitting with a side zipper that stays concealed from sight, enough padding in the bust that you will not need to wear a bra, and a skirt that flows like liquid when you move around in it. I loved getting dressed up for the evening, and couldn’t wait to wear the dress. Wearing a slip with the dress made it easier for me to smooth down some of my extra tummy weight as well as zip up the dress on my own. In addition to green, the dress is also available in blue, red, black, and purple. The straps were a little bit loose for me, so I may get them tailored for the next time I want to wear this dress. Other than that, the dress was a perfect fit! I felt confident and beautiful, and received plenty of compliments. Wear an Ever-Pretty dress, and you’ll feel the same way! Check out the wide selection of Ever-Pretty dresses on the U.S. and Canadian Ever-Pretty website and receive free shipping on all orders shipped to the U.S. mainland. International shoppers, please visit the Ever-Pretty international website to place your orders. As I mentioned above, I purchased my first Ever-Pretty dress through Amazon.com. If you happen to see an Ever-Pretty dress at a lower price on Amazon.com, simply contact Ever-Pretty’s customer service and they will be happy to price match for you. To keep up to date with all of the newest styles and promotions from Ever-Pretty, be sure to “like” Ever-Pretty on Facebook. Love the dress! You look great! Gorgeous dress! And you cannot beat the price..I’ll keep them in mind when I next need a dressy-dress! What a beautiful dress at a beautiful price point! Thanks for the introduction, I’m going to check out some dresses! What a very beautiful dress and you looked very nice in it! The style is very flattering, and the price is not to much. I am going to take a look at the website. What a lovely photo!!!! You cannot beat a beautiful outfit at a reasonable price! It’s a beautiful dress and a beautiful picture! I hope you had as much fun as you should have in this lovely dress. Thank for introducing me to this company. I am almost always at a loss when it comes to a dress for the company holiday party since I don’t care to spend an arm and a leg to only wear a dress once. The dress is stunning on you! And I can’t believe the price, it’s amazing!! This is an excellent example of a very versatile dress. You can wear to a cocktail party, a work party, wedding or a as a bridesmaid dress. Thank you. I hadn’t really thought about online shopping for formal dresses but this is beautiful. Very elegant and fun! Thanks for the information on how to do returns and using the size chart. I’m glad they offer a detailed size chart because you never know on sizes. The dresses look absolutely stunning on their website I love it so much. It’s seriously the perfect dress for a wonderful price. That dress is so pretty! I love the color. You look gorgeous! I love that dress – very elegant and classy! Glamorous, perfect fit-captures the spirit of Ariel’s adventurousness and fantasy of everlasting romance!